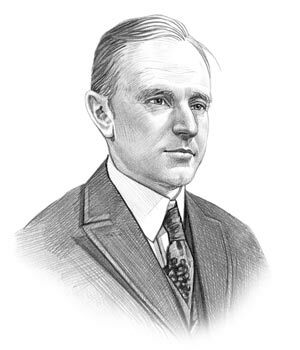 Calvin Coolidge was the 30th American President who served in office from August 2, 1923 to March 4, 1929. One of the important events during his presidency was the Immigration Act of 1924. The following fact sheet contains interesting facts and information on Immigration Act of 1924 for kids. Fact 1: The objective of the act was to limit the migration of aliens into the United States. The law limited the number of immigrants allowed entry into the United States through a national origins quota which was designed to select immigrants deemed to be best suited to American society. Fact 2: When was the 1924 Immigration Act passed? The Immigration Act of 1924 was approved by Congress on May 26, 1924. Fact 3: The law is also referred to as the Johnson-Reed Act after its congressional sponsors, Representative Albert Johnson (1869-1957) and Senator David Reed (1880-1953). Fact 4: The 1924 law immediately reduced the 1921 temporary annual quota of immigrants allowed to enter the US from 358,000 to 154,000. Fact 6: The percentage quota limited immigration visas was reduced from 3% to 2% of the total number of people of each nationality in the United States, according to the 1890 national census. Fact 7: The law prohibited entry of aliens not eligible for US citizenship, thereby formally excluding entry of Japanese, Chinese, and other Asian immigrants. Fact 8: The “consular control system” of immigration was established requiring that all immigrants had to obtain a visa from an American consul in their country of origin. Fact 9: By using the US 1890 population census, rather than the censuses taken in 1910 or 1920, the law excluded the new wave of foreign-born from South-Eastern Europe (referred to as "New Immigrants" from quotas that were truly proportionate to their new numbers in the US population. Immigration Act of 1924 Fact 11: The Dillingham Commission Report had concluded that the "New Immigrants" from South-Eastern Europe were "inferior, uneducated and posed a serious threat to American society" and recommended that immigration to America by "New Immigrants" should be restricted. Immigration Act of 1924 Fact 14: Whilst the law cut the percentage quota for North-Western European countries it absolutely slashed the percentage quota for South-Eastern European countries. Immigration Act of 1924 Fact 16: Between 1901 - 1920 over 14 million immigrants arrived in the US, to the alarm of established Americans. The US census of 1910 and 1920 therefore reflected the massive immigration levels from South-Eastern European countries (which would have increased their percentage quotas). 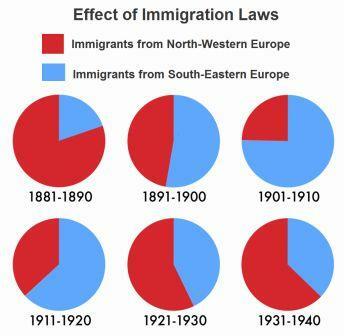 Immigration Act of 1924 Fact 17: The effect of the law was staggering. For example, the quota for Italy, was reduced from 42,057 to 3,845 people. Immigration Act of 1924 Fact 18: The law exempted people from the Western Hemisphere from the quota system and a record number of Mexican immigrants entered the United States. Mexican labor was needed in the labor-short farmlands of America. According to the U.S. census between 1910 and 1930, the number of immigrants from Mexico tripled from 200,000 to 600,000 - refer to Mexican Migration. Immigration Act of 1924 Fact 19: The Immigration Act of 1924 governed US immigration policy until revisions were made in the Immigration and Nationality Act of 1952. Immigration Act of 1924 Fact 20: Immigration to the United States markedly decreased, in part because of the Immigration Act of 1924, but also because of worldwide economic depression. Immigration Act of 1924 Fact 22: The Immigration Act of 1924 governed US immigration policy until revisions were made in the Immigration and Nationality Act of 1952. Immigration Act of 1924 Fact 23: The percentage quotas remained in place with minor alterations until the Immigration and Nationality Act of 1965. The article on the Immigration Act of 1924 provides detailed facts and a summary of one of the important events during his presidential term in office. The following Calvin Coolidge video will give you additional important facts and dates about the political events experienced by the 30th American President whose presidency spanned from August 2, 1923 to March 4, 1929.